The Friday after Thanksgiving is usually known as Black Friday, with a ton of great shopping deals for people to get Christmas shopping out of the way. If youâ€™re a Golden Knights fan though, you celebrate Gold Friday. The Arsenal, The Armory and VegasTeamStore.com had some golden deals starting at 8 a.m. PT that Golden Knights fans were ecstatic about. One of the most exciting items on sale is the Vegas Golden Knights Inaugural Season Book. It features key moments from the teamâ€™s thrilling inaugural seas, with an augmented reality video feature to bring fans back into all the action. William Karlsson and Shea Theodore were able to relive some of the incredible moments. VGK holiday sweaters and onesies were a big debut! The Arsenal introduced an exclusive 16-pin inaugural milestone pin set. get ready throw these bad boys onto the ice for our next hat trick! A new line of premium New Era hats were launched on Gold Friday. Nate Schmidt and Cody Eakin were the first to try them on. 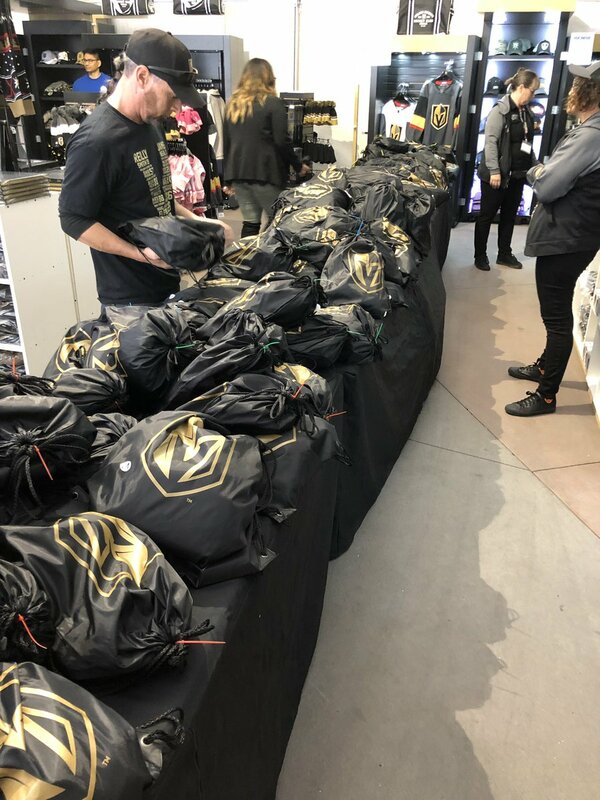 The Armory at T-Mobile Arena had special mystery bags for $50 containing a minimum of $90 worth of VGK gear! Jerseys, gift cards, shirts, who knows what else were included in the bags.